"If the world hates you, you know that it hated Me before it hated you. If you were of the world, the world would love its own. Yet because you are not of the world, but I chose you out of the world, therefore the world hates you. Remember the word that I said to you... If they persecuted Me, they will also persecute you... because they do not know Him who sent Me." "These things I have spoken to you, that you should not be made to stumble. They will put you out of the synagogues [today it might be from churches]; yes, the time is coming that whoever kills you will think that he offers God service. And these things they will do to you because they have not known the Father nor Me. But these things I have told you, that when the time comes, you may remember that I told you of them." "I have given them Your word; and the world has hated them because they are not of the world, just as I am not of the world. I do not pray that You should take them out of the world, but that You should keep them from the evil one." "And I, brethren, if I still preach circumcision, why do I still suffer persecution? Then the offense of the cross has ceased." "Nevertheless even among the rulers many believed in Him, but because of the Pharisees they did not confess Him, lest they should be put out of the synagogue; for they loved the praise of men more than the praise of God." "Behold, I send you out as sheep in the midst of wolves. Therefore be wise as serpents and harmless as doves. But beware of men, for they will deliver you up to councils and scourge you in their synagogues....But when they deliver you up, do not worry about how or what you should speak. For it will be given to you in that hour what you should speak; for it is not you who speak, but the Spirit of your Father who speaks in you." "Blessed are those who are persecuted for righteousness' sake, For theirs is the kingdom of heaven. Blessed are you when they revile and persecute you, and say all kinds of evil against you falsely for My sake. Rejoice and be exceedingly glad, for great is your reward in heaven...."
"Jesus answered and said, "You do not know what you ask. Are you able to drink the cup that I am about to drink, and be baptized with the baptism that I am baptized with?" They said to Him, "We are able." "In the same way, He took the cup after they had eaten saying, "This cup which is poured out for you is the new covenant in My blood." "The Spirit Himself bears witness with our spirit that we are children of God, and if children, then heirs-heirs of God and joint heirs with Christ, if indeed we suffer with Him, that we may also be glorified together. For I consider that the sufferings of this present time are not worthy to be compared with the glory which shall be revealed in us." "Who shall separate us from the love of Christ? Shall tribulation, or distress, or persecution, or famine, or nakedness, or peril, or sword? ...Yet in all these things we are more than conquerors through Him who loved us. For I am persuaded that neither death nor life, nor angels nor principalities nor powers, nor things present nor things to come, nor height nor depth, nor any other created thing, shall be able to separate us from the love of God which is in Christ Jesus our Lord." "But we have this treasure in earthen vessels, that the excellence of the power may be of God and not of us. We are hard pressedon every side, yet not crushed; we are perplexed, but not in despair; persecuted, but not forsaken; struck down, but not destroyed- always carrying about in the body the dying of the Lord Jesus, that the life of Jesus also may be manifested in our body." "And He said to me, 'My grace is sufficient for you, for My strength is made perfect in weakness.' Therefore most gladly I will rather boast in my infirmities, that the power of Christ may rest upon me. Therefore I take pleasure in infirmities, in reproaches, in needs, in persecutions, in distresses, for Christ's sake. For when I am weak, then I am strong." "Now brother will deliver up brother to death, and a father his child; and children will rise up against parents and cause them to be put to death. And you will be hated by all for My name's sake." "... you will be hated by all nations for My name's sake... And then many will be offended, will betray one another, and will hate one another. Then many false prophets will rise up and deceive many. And because lawlessness will abound, the love of many will grow cold. But he who endures to the end shall be saved." "Now brother will betray brother to death, and a father his child; and children will rise up against parents and cause them to be put to death. And you will be hated by all for My name's sake. But he who endures to the end shall be saved." "But know this, that in the last days perilous times will come: For men will be lovers of themselves, lovers of money, boasters, proud, blasphemers, disobedient to parents, unthankful, unholy, unloving, unforgiving, slanderers, without self-control, brutal,despisers of good, traitors, headstrong, haughty, lovers of pleasure rather than lovers of God…. And from such people turn away! 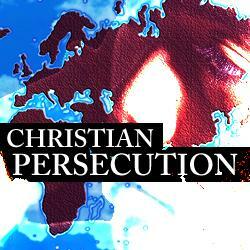 "…all who desire to live godly in Christ Jesus will suffer persecution. But evil men and impostors will grow worse and worse, deceiving and being deceived. But you must continue in the things which you have learned ..."
"…they will lay hands on you and persecute you. They will deliver you to synagogues and prisons, and you will be brought before kings and governors, and all on account of my name. This will result in your being witnesses to them. But make up your mind not to worry beforehand how you will defend yourselves. For I will give you words and wisdom that none of your adversaries will be able to resist or contradict. You will be betrayed even by parents, brothers, relatives and friends, and they will put some of you to death." "I saw the woman, drunk with the blood of the saints and with the blood of the martyrs of Jesus. And when I saw her, I marveled with great amazement." Save me for Your mercies' sake." "You have heard that it was said, 'You shall love your neighbor and hate your enemy.' "But I say to you, love your enemies, bless those who curse you, do good to those who hate you, and pray for those who spitefully use you and persecute you..."
"Whoever desires to come after Me, let him deny himself, and take up his cross, and follow Me. For whoever desires to save his life will lose it, but whoever loses his life for My sake and the gospel's will save it. For what will it profit a man if he gains the whole world, and loses his own soul?" "But when they arrest you and deliver you up, do not worry beforehand, or premeditate what you will speak. But whatever is given you in that hour, speak that; for it is not you who speak, but the Holy Spirit." " Then they... commanded them not to speak or teach at all in the name of Jesus. But Peter and John replied, "Judge for yourselves whether it is right in God's sight to obey you rather than God. For we cannot help speaking about what we have seen and heard." "Did we not strictly command you not to teach in this name? And look, you have filled Jerusalem with your doctrine, and intend to bring this Man's blood on us!" But Peter and the other apostles answered and said: 'We ought to obey God rather than men.'" "They called the apostles in and had them flogged. Then they ordered them not to speak in the name of Jesus, and let them go. The apostles left... rejoicing because they had been counted worthy of suffering disgrace for the Name. Day after day, in the temple courts and from house to house, they never stopped teaching and proclaiming the good news that Jesus is the Christ." "When they heard these things they were cut to the heart, and they gnashed at him with their teeth. But he, being full of the Holy Spirit, gazed into heaven and saw the glory of God, and Jesus standing at the right hand of God, and said, 'Look! I see the heavens opened and the Son of Man standing at the right hand of God!' Then they cried out with a loud voice, stopped their ears, and ran at him with one accord..."
"... we ourselves boast of you among the churches of God for your patience and faith in all your persecutions and tribulations that you endure, which is manifest evidence of the righteous judgment of God, that you may be counted worthy of the kingdom of God, for which you also suffer...."
If we deny Him, He also will deny us." "By faith Moses, when he became of age, refused to be called the son of Pharaoh's daughter, choosing rather to suffer affliction with the people of God than to enjoy the passing pleasures of sin, esteeming the reproach of Christ greater riches than the treasures in Egypt; for he looked to the reward. By faith he forsook Egypt, not fearing the wrath of the king; for he endured as seeing Him who is invisible." "Therefore Jesus also, that He might sanctify the people with His own blood, suffered outside the gate. Therefore let us go forth to Him, outside the camp, bearing His reproach. For here we have no continuing city, but we seek the one to come. Therefore by Him let us continually offer the sacrifice of praise to God, that is, the fruit of our lips, giving thanks to His name. " "... if you suffer for doing good and you endure it, this is commendable before God. To this you were called, because Christ suffered for you, leaving you an example, that you should follow in his steps. He committed no sin, and no deceit was found in his mouth." When they hurled their insults at him, he did not retaliate; when he suffered, he made no threats. Instead, he entrusted himself to him who judges justly." "But even if you should suffer for righteousness' sake, you are blessed. "And do not be afraid of their threats, nor be troubled." But sanctify the Lord God in your hearts, and always be ready to give a defense to everyone who asks you a reason for the hope that is in you, with meekness and fear." "Beloved, do not think it strange concerning the fiery trial which is to try you, as though some strange thing happened to you; but rejoice to the extent that you partake of Christ's sufferings, that when His glory is revealed, you may also be glad with exceeding joy." "Do not marvel, my brethren, if the world hates you." "...hear the parable of the sower: ... But he who received the seed on stony places, this is he who hears the word and immediately receives it with joy; yet he has no root in himself, but endures only for a while. For when tribulation orpersecution arises because of the word, immediately he stumbles." "For whoever is ashamed of Me and My words in this adulterous and sinful generation, of him the Son of Man also will be ashamed when He comes...."
"... no one stood with me, but all forsook me... But the Lord stood with me and strengthened me, so that the message might be preached fully through me..."
"But recall the former days .... you endured a great struggle with sufferings: partly while you were made a spectacle both by reproaches and tribulations, and partly while you became companions of those who were so treated; for you had compassion on me in my chains, and joyfully accepted the plundering of your goods, knowing that you have a better and an enduring possession for yourselves in heaven. Therefore do not cast away your confidence, which has great reward. For you have need of endurance, so that after you have done the will of God, you may receive the promise." "You have heard... how I persecuted the church of God beyond measure and tried to destroy it.... But ... it pleased God… to reveal His Son in me, that I might preach Him among the Gentiles...."
But they were hearing only, "He who formerly persecuted us now preaches the faith which he once tried to destroy." And they glorified God in me. Notice that His triumphs are also shown in the above sections.